In large skillet, melt 1 tablespoon of the butter over medium-high heat. Cook scallops in butter about 5 minutes, turning once, until golden brown on outside and white and opaque inside. Remove scallops to serving plate; cover to keep warm. Add garlic, shallot, wine and vinegar to skillet, stirring to loosen brown particles. Cook until liquid is reduced to less than half. Reduce heat to low; add 4 tablespoons butter. Cook and stir until butter is melted. Add remaining 3 tablespoons butter; cook and stir until sauce is thickened and creamy. Press sauce through fine strainer; discard solids. Pour sauce over scallops. Serve immediately. For best results, use a nonstick skillet and make sure scallops are very dry. Pat them with paper towels to help remove moisture. 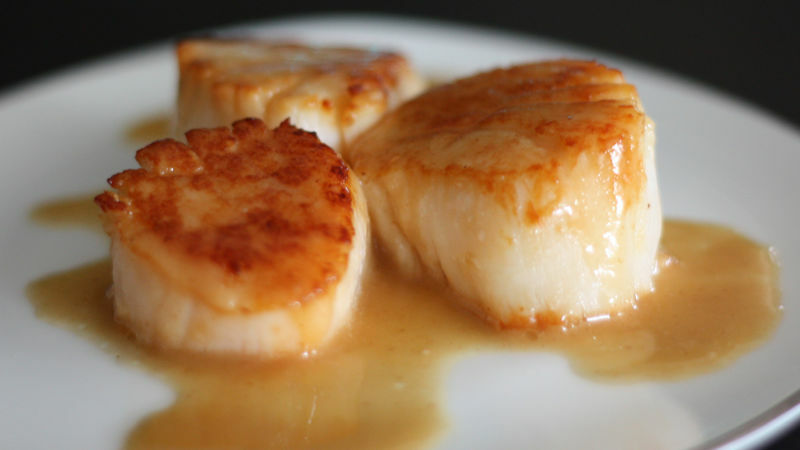 Gather ingredients before cooking and keep them next to the stove, as the scallops and sauce cook quickly. If juices accumulate on the serving plate, add them to the sauce after it has reduced for even more flavor. Cook with a wine that you would serve to guests. Higher quality ingredients produce tastier results!